Want to bring a speaker from the EF! movement to your community? Check out the EF! Speakers Bureau. Earth First! formed in 1979, in response to an increasingly corporate, compromising and ineffective environmental community. It is not an organization, but a movement. 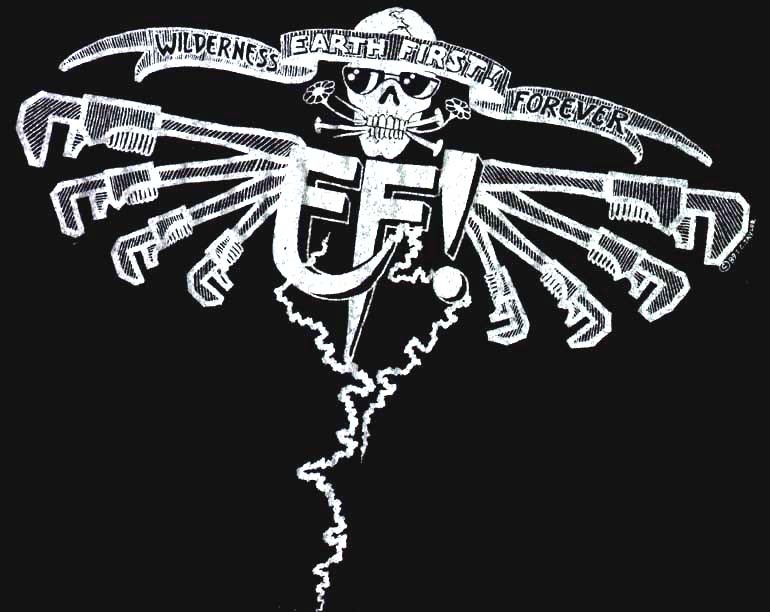 There are no “members” of EF!, only Earth First!ers. We believe in using all of the tools in the toolbox, from grassroots and legal organizing to civil disobedience and monkeywrenching. When the law won’t fix the problem, we put our bodies on the line to stop the destruction. Earth First!’s direct-action approach draws attention to the crises facing the natural world, and it saves lives. 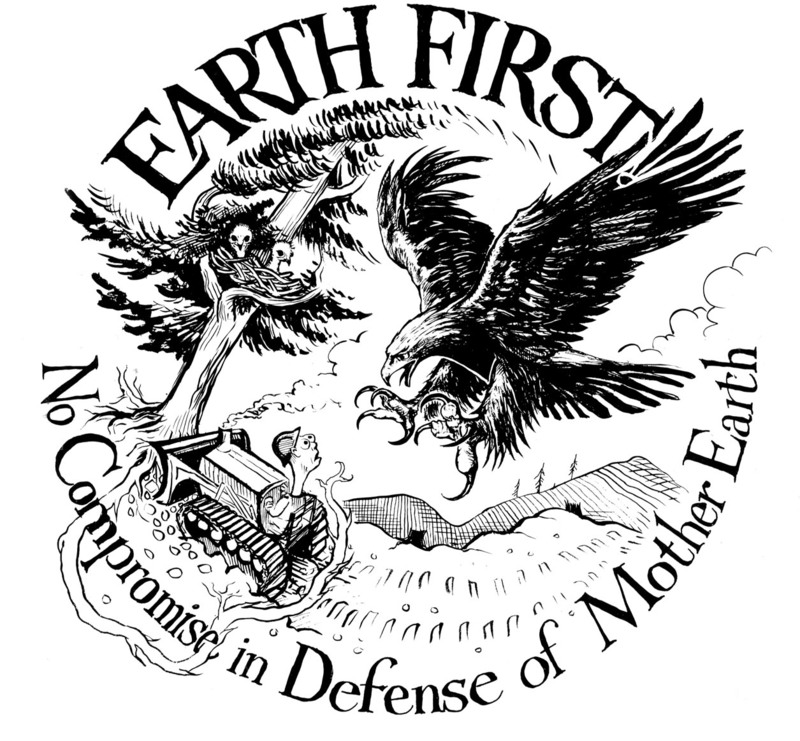 Guided by a philosophy of deep ecology, Earth First! does not accept a human-centered worldview of “nature for people’s sake.” Instead, we believe that life exists for its own sake, that industrial civilization and its philosophy are anti-Earth, anti-woman and anti-liberty. Our structure is non-hierarchical, and we reject highly paid “professional staff” and formal leadership. The Earth First! Journal is a voice of the ecological resistance movement. Published four times a year, it contains reports on direct action, articles on the preservation of wilderness and biological diversity, news and announcements about EF! and other radical environmental groups, investigative articles, critiques of the entire environmental movement, book and music reviews, essays exploring ecological theory and a lively letters-to-the-editor section. The Earth First! Journal and Newswire are essential forums for discussion within the Earth First! movement. They are meant to be bold, controversial, amusing and diverse in content and style. You won’t find hard-hitting news like this anywhere else. Interested in joining the collective? Fill out this application and send it in. Swamp troglodytes of the Loxahatchee watershed, hard at work in their outdoor office… This could be you! I am apart of the EF! Journal Collective, please e-mail me and let me know if you sent your subscription in the post or signed-up through our http://www.earthfirstjournal.org website. Thanks for contacting us and subscribing to the EF! Journal. Hi, my name is Annie Mond and I am a good friend of Leah’s. She gave my your website address to contact you. I want to submit some things to you about the ongoing genocide of wild horses in the United States, including an excellent news documentary by a hard hitting reporter named George Knapp. I am networking hard on Facebook and have some great passionate connections who are very knowledgeable and I want to share information with your news service. How do I do this? She asked me to write an article for the Journal, but the situation with wild horses is so dire that I want to inform more people about it sooner that any article could be published in the EFJ. I’m not going to reinvent the wheel, just forward some excellent things already written by other people. Our wild horses are at great risk of becoming extinct soon, because of the helicopter roundups being conducted by the Bureau of Land Management, which is overseen by the Department of the Interior, ala Ken Salazar. Many of these horses die as a result of the roundups, die in their captivity, or are sold to be slaughtered. All colts under four years of age are being gelded and the numbers of wild horses left in remaining herds may be dropping below levels of genetic viability, all because of greedy welfared cattle ranchers, and mineral rights. It’s a dire situation. More people needs to know about this. If we don’t stop it, the wild horses will be gone. HI JAY! Please send us an e-mail to: nettle@earthfirstjournal.org so we can get you some info! Sorry we didn’t reply sooner – we didn’t see your message until now. Would you like to sign up to receive the Earth First! Journal by mail or are you interested to “sign up” to be apart of Earth First!? You can subscribe to the EF! Journal by clicking the “Donate/Subscribe” tab at the top of this page or by mailing in a check or money order to the EF! Journal office. For more info on mail-order subscriptions send me an email and I will let you know all the info that is needed to receive the next issue. Earth First! is a movement, though it is not an organization with members. There is more information about what the movement and Earth First! groups that exist around the world on the home page of this website and on the: http://www.earthfirstjournal.org website. Find out if there is an active group near you, if not, consider starting one! I would like to know more about your organization, I think it is very interesting. Also if you have meeting in Tampa Bay Area. Please let me know. I look foward hearing from you. I have submitted an article to you but i didn’t get the response till toady. Kindly reply me whether it publish or not in your journal. Please send an e-mail to the collective: collective [at] earthfirstjournal.org so we can discuss your submission. thanks! hey – i don’t know if it’s a matter of timing or something to do with staff, but the newswire seems to be having a much more international perspective lately, and it’s wonderful to see…good work, and glad to see it continue! Hey, thanks for the comment. It isn’t a change of heart or new staff, just seems to be more available to post. We’ll keep it coming! I have patiently read your material over many, many years. The disappointment I have felt recently overwhelms me, frankly. Your incessant intervention into affairs regarding DGR is simply not good. You have openly called for people to leave the organization. Your editorials give support to those who woujld organize to cancel events set up for members of that organization to speak in public. I don’t know what has gotten into you, but I am no longer a supporter. And I am happy to say it. We also haven’t called for groups to cancel DGR’s events. We have published two articles from groups that have disinvited DGR (Bluestockings and Resistance Ecology) to show what the radical community’s response has been. Looking forward to following your site. In fact my family and I are downsizing and hoping to one day live in a Tiny Home with ecofriendly, off-grid. I am game my husband is a little apprehensive, so any information on this subject is greatly appreciated. My daughter, Becca and I are trying to put Earth first and eager to learn how we can protect it. Also, a nature person she is an animal protector as well, so I am going to support her as well in her quest. Have a wonderful day, Allie. Hi, I too was inspired by Dave Foreman and others who got this ball rolling. After spending years involved in Redwood Summer I eventually decided to try to become part of the timber industry and study forestry in college. I did just that and now develop sustainable timber harvest plans in CA. I hope your new evolution of EF! can recognize the benefit of supporting a changing environment in logging – and the application of modern sustainable on-the-ground practices being implemented everyday in the west. We can all learn from the transgressions of the past and better shape the culture within forest management in the future. Actual deforestation from development continue to be our biggest threat. Please focus your efforts! “According to Lameman’s source, the damage was described to her as “black puddles” or “black spots” coming up in different areas. An employee on site confirmed that the tar sands emulsion seeping from the ground is not a pipeline spill. What’s more, industry and government do not even know what the spill is. They also know there’s a lot of oil seeping, and they don’t know what it’s coming from.